The government of Ecuador is attempting to prevent the release of information related to its contract with a New York-based public relations firm that may have violated federal law and is under investigation in the South American nation. A federal judge in New York last week ordered the firm, MCSquared PR, to turn over documents related to its work for the government. The order came as part of an ongoing legal action brought by Chevron against the financiers of a number of attorneys that won a $9 billion judgment against the company for environmental contamination in the Ecuadorian Amazon. Chevron has alleged a widespread campaign of fraud, extortion, and bribery by plaintiffs’ attorneys in that case, and brought a racketeering suit against them in U.S. courts. They also brought a suit against a Gibraltar-based investment firm that financed the plaintiffs’ efforts. As part of the latter suit, Chevron won court approval last week for a subpoena seeking a number of documents from MCSquared related to its work for the Ecuadorian government. That work was part of a $6.4 million public relations contract "to inform the U.S. public of Chevron’s responsibilities so the public interest of Ecuador will be furthered." The firm’s work involved routine denunciations of the oil company in U.S. media, the payment of "extras" to protest outside a Chevron shareholders meeting, and junkets to the Amazon by celebrities including Mia Farrow and Danny Glover. The contract has come under scrutiny since the Washington Free Beacon reported that MCSquared did not notify the Justice Department of its work, as required by the Foreign Agent Registration Act, for months after the contract was signed. The Ecuadorian government is now trying to prevent the release of information about MCSquared’s dealing with that government. In a motion to intervene filed last week, it argued that the court’s discovery order may violate its sovereign immunity. However, Chevron has not requested any documents from the government itself, though it is seeking communications between MCSquared and Ecuadorian officials. According to Chevron, those communications may reveal details of the role of the Ecuadorian government in promoting the lawsuit against the company in the South American nation. President Rafael Correa, who routinely denigrates Chevron in an official capacity, exerted significant political pressure on plaintiffs’ behalf in an effort to pressure the court into deciding in their favor, Chevron claims. Correa, who was elected in 2006, paints Chevron as corrupt imperialists attempting to evade their obligations to clean up areas of the Amazon contaminated by Texaco, which Chevron acquired in 2001. After MCSquared began making headlines for its work on behalf of the Ecuadorian government, and its failure to disclose that work to DOJ, its employees began scrubbing their social media accounts of information connecting them to the Correa regime. "MCSquared's principals … began deleting references to the ROE in their social media profiles and feeds" in June, the company said in its request for discovery. The firm’s president removed references to her husband, a former Ecuadorian government official. Another MCSquared employee, who previously worked for the government, deleted her LinkedIn profile. Correa himself has been dodgy about what the MCSquared contract entailed. "There are things that can't be specifically stated in a contract," he said of the scope of the firm’s work. "Let's move on." As Chevron seeks scrutiny of MCSquared’s activities on behalf of the government, Ecuadorian officials are probing the contract in their own official investigation. National assemblyman Andrés Páez, who requested the investigation, noted in his complaint to the prosecutor general that MCSquared’s FARA filings listed the value of the contract at $6.4 million, but only showed expenses of $1.9 million. The investigation, he says, is designed to ensure the responsible stewardship of taxpayers’ money. He also noted financial discrepancies in MCSquared’s work with American celebrities. Mia Farrow has denied receiving the $188,000 that MCSquared listed as their payment for her junket to the Amazon. MCSquared paid her "nowhere near that amount," she said. Páez does not expect a resolution to these questions in Ecuador, nor does he expect prominent public figures to be held to account by a Correa administration that, he says, wields tremendous political influence over the country’s judiciary. 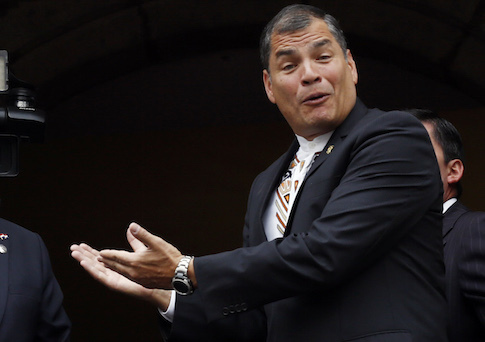 "This case, in the judicial system of Ecuador, is going nowhere," Páez said in an interview. He hopes that American courts will expose the cronyism that he says is rampant in the Ecuadorian government’s procurement process. In the United States, unlike Ecuador, Páez said, "they cannot manipulate judges, they cannot manipulate institutions, they cannot manipulate people." The fact that MCSquared is headquartered in the United States is "the only advantage that I have." He and Chevron could also benefit from the fact that, due to MCSquared’s location in Brooklyn, the same federal judge who recently ruled that the environmentalist plaintiffs were engaged in a criminal conspiracy will adjudicate Chevron’s discovery request.